CAYCE, S.C. (Reuters) – An Amtrak passenger train apparently traveling on the wrong track collided with a parked freight train in South Carolina on Sunday, killing two crew members and injuring at least 116 other people in the railroad’s third fatal crash in as many months, authorities said. Investigators from the National Transportation Safety Board were in Cayce, South Carolina, where Amtrak Train 91, carrying 139 passengers and eight crew to Miami from New York, hit the CSX Corp (NASDAQ:CSX) freight train at about 2:35 a.m. local time (0735 GMT) and derailed near the state capital Columbia. Amtrak engineer Michael Kempf, 54, of Savannah, Georgia, and conductor Michael Cella, 36, of Orange Park, Florida, were killed, Lexington County Coroner Margaret Fisher told reporters at a news conference. Autopsies were underway, she said. Two of the 116 people injured were in critical condition, authorities said. The area has three rows of tracks, and the freight train was parked on a “loading track or a side track” and “not the main track,” McMaster said. Amtrak said it was “deeply saddened” by the deaths. It said CSX owns and maintains the area where the crash occurred. “CSX controls the dispatching of all trains, including directing the signal systems which control access to sidings and yards,” Amtrak said in a statement. The southbound passenger train’s locomotive was lying on its side, and the first car was bent and also derailed, although it remained upright, images from the scene showed. At least four cars of the freight train, which was northbound before it was parked, were crumpled, looking like crushed tin foil, but remained on the tracks. The passenger train was part of Amtrak’ Silver Star Service, and the wreck occurred about 5 miles (8 km) southwest of Columbia. Officials said some 5,000 gallons of fuel leaked as a result of the collision, but it was under control and no threat to public safety. U.S. President Donald Trump was getting regular updates on the crash while at his resort in Palm Beach, Florida. McMaster said he had been told the Amtrak train was traveling at about 59 miles (95 km) per hour upon impact. The NTSB investigation will seek to confirm its speed. In December, three people were killed when an Amtrak passenger train derailed in Washington state. The engineer later told the NTSB he had misread a signal and tried to brake before the accident. 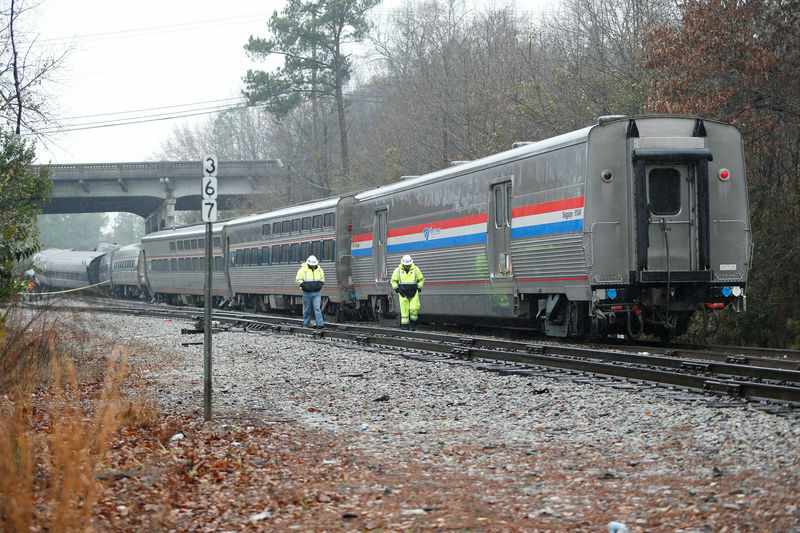 In late January, an Amtrak train carrying Republican members of the U.S. Congress killed one person in a garbage truck with which it collided in Virginia. A Federal Railroad Administration Investigative team was also in Cayce to help establish what happened.